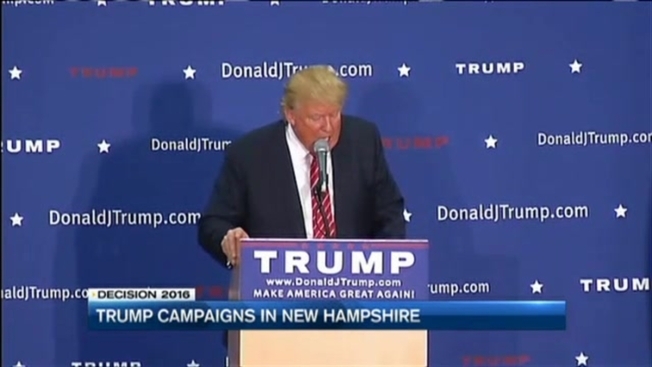 Donald Trump in True Form in N.H.
Fresh off a new poll that shows Donald Trump maintaining a lead in a crowded republican field, the presidential candidate held a rally in Keene, New Hampshire. There were more than 3,500 people inside the Keene High School gym for Wednesday night's event. Trump proved to be in true form, not mincing words about President Obama or any of the other candidates in the race for the White House. "It's all political bullsh*t," he said. It was those kinds of unfiltered comments that drew the biggest applause during the night, though some voters admitted it was a bit unsettling. "He's a little rough with some smaller children around, luckily mine were home," said Michelle Colbert from Swanzey. Trump focused on his newly unveiled tax plan to close loopholes, simplify the tax code, and cut rates. "The plan will provide major tax relief for middle income and most other Americans," Trump said. He also talked about immigration policy and promised to build a wall. "People have to come into our country legally, they have to do it," he said. And then went on to take hardline stance on the Syrian refugee crisis. "If I win, they're going back, they're going back," Trump said. "I know a lot of people are going to say that's not nice, but we can't afford to be nice." Trump supporters agree, saying this election isn't about finding a "nice" president, but a competent one. "He seems like an honest, straightforward person and I respect that," Colbert said. Trump is the front runner in republican polls in New Hampshire with a 10 point lead over Carly Fiorina, 26-16. But in a head-to-head matchup against Democrat Hillary Clinton, Trump trails by 10 points. Nationally, Trump and Ben Carson are in a statistical tie at 21 and 20 percent of likely republican primary voters.